I’m standing on the edge of a cliff overlooking the Pacific Ocean getting ready to jump. No, it’s not a metaphor. Or a cry for help. 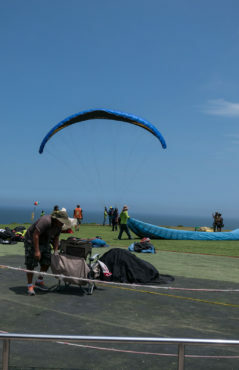 I’m harnessed up, ready to paraglide over the coast of Lima, Peru. You might think I’m a bit of a daredevil, into the latest high adventure craziness. But you would be wrong. The older I get the more painfully aware I am of my own mortality. I know now what could go wrong and am quite afraid of pain, not death so much, just pain. So as my instructor – was his name David? I’ll call him David – buckles up the last of my harnesses I’m silently wondering what the hell got me into this mess, and will those buckles actually hold? I know, of course, why I’m here. A couple of people in my Two’s A Crowd tour group thought it would be a great way to begin our tour of South America. It’s the first day of the tour, but all we’re really meant to do today is have a welcome talk with our tour leader and then go for a get-to-know-you dinner. Instead, here I am waiting to jump. The oldest of the women with me is in her 70s and was keen, very keen. So I couldn’t very well say no now could I? So here I am waiting for the wind to pick up enough to allow us to soar off the edge of the cliff. 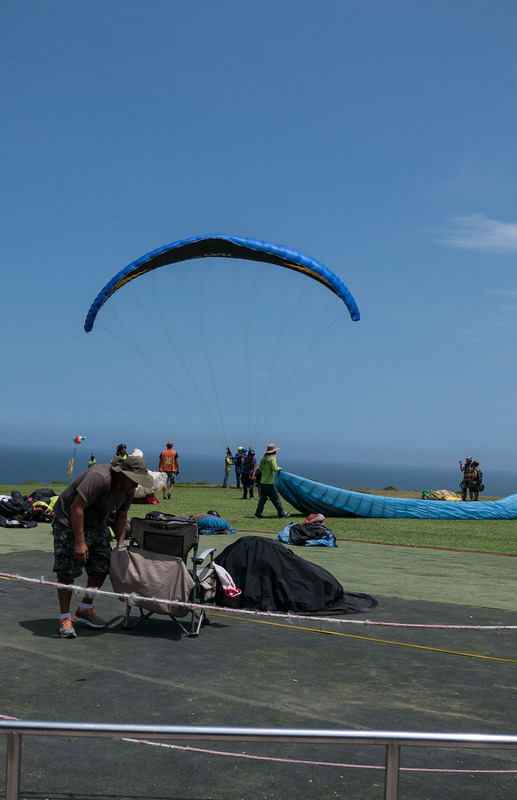 I’m up first, something to do with weight and low wind levels meaning if you weigh any more than 60 kilos at the moment you probably won’t get off the ground. So I’m picked out of our line up and told to go see my instructor. David, who wouldn’t look out of place as Chris Hemsworth’s stunt double in Thor, tells me he was a lawyer but decided to give it away to parasail for a living. “It’s my third day,” he laughs. Luckily I remember that he had told me earlier he’d been doing this for about five years so I know I’m in good hands. And then we wait. And wait. Seems the wind has died down. I can wait, if I like, David tells me, until the wind picks up again. But I take it as a sign; we’re not meant to fly today and allow him to unharness me with promises that we’ll come back when it’s windier. 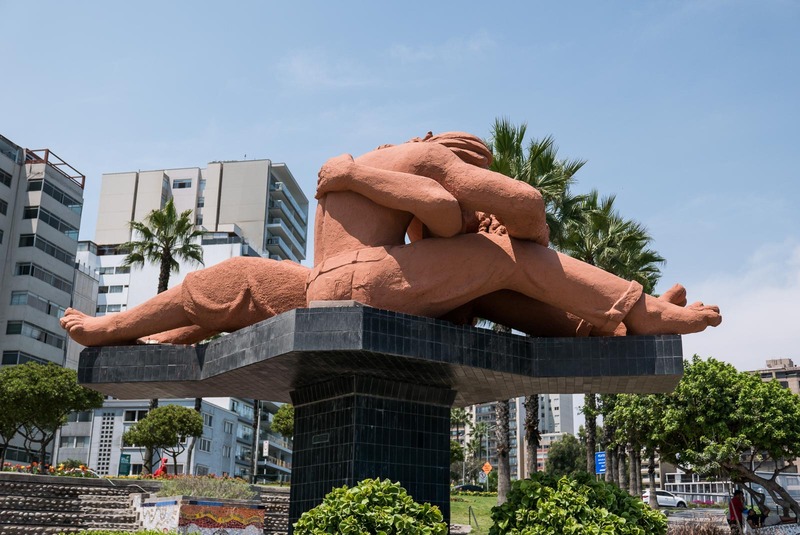 Our moment of daredevil madness over, we opt to wander through El Parque del Amor –Love Park – immediately identifiable by the giant sculpture of a couple cavorting on a platform – ‘El Beso’ (the kiss) by artist Victor Delfin. Not surprisingly the park is dedicated to love and aside from the sculpture, which dominates the site the park boasts beautifully manicured gardens and a lovely mosaic wall that follows the curve of the cliff overlooking the ocean. It’s hard to know where to look. 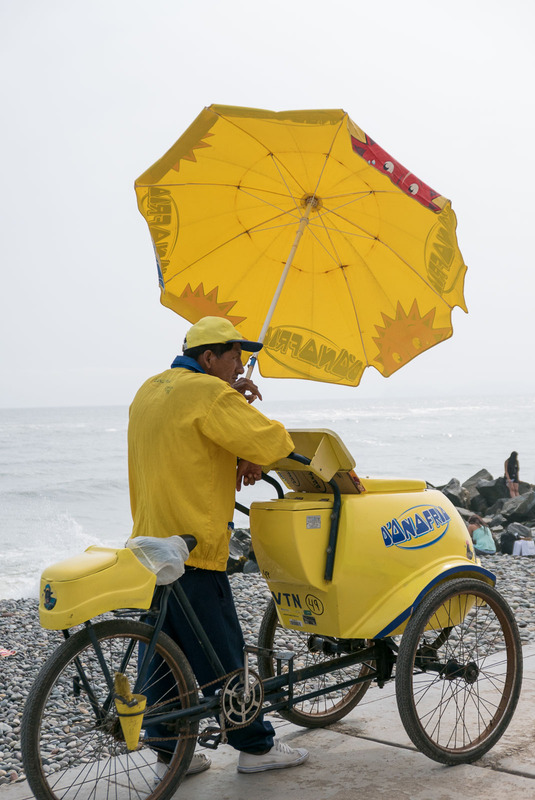 But over the next couple of days we discover Lima is like that. Inca ruins compete with lovely Spanish architecture to attract out attention. 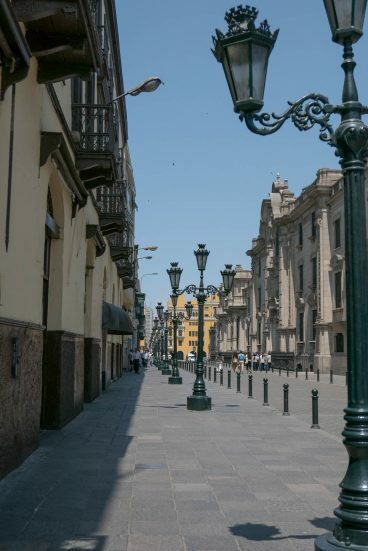 In the city centre we walk through the Plaza de Armas, the main square, marvelling over the opulence of the historic buildings, all rebuilt after 1746 when the city was almost completely destroyed by an earthquake. 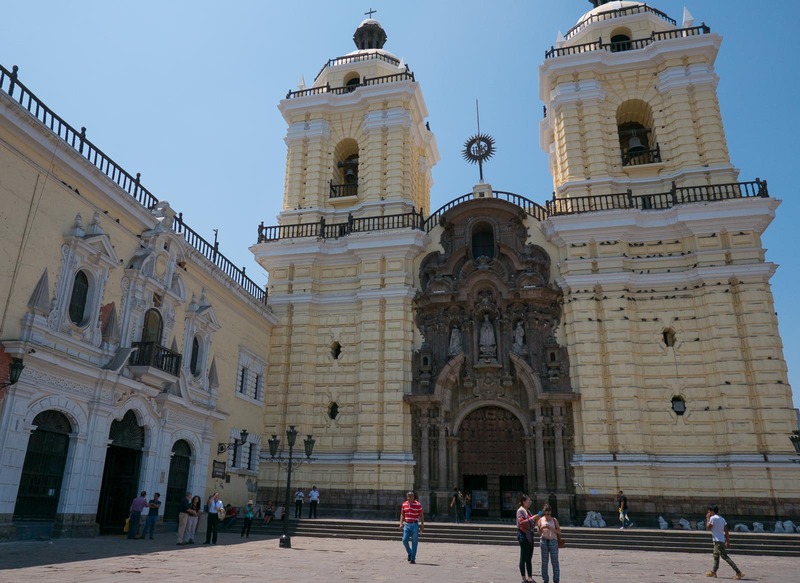 After a quick look around the main square we’re whisked off to the San Francisco Monastery. It’s a quick look through the amazing monastery because the real highlights here are the catacombs and the library. Filled with historic manuscripts and decked out in ornate timber the library could have held me captivated for hours. There are said to be around 25,000 antique books held here, some predating the Spanish arrival of the city. The catacombs are an intriguing series of rooms underneath the monastery housing thousands of bones and skulls. Found in 1943 the site is said to have been a burial ground for 25,000 bodies and the accoustics are such that those who have passed over into the afterlife could hear the cathedral services above from their final resting place. The Monastery was completed in 1774, and has withstood a series of earthquakes over the years. And as interesting as its history is, in the afternoon we go even further back through the ages. Back to before even the Incas ruled these lands. 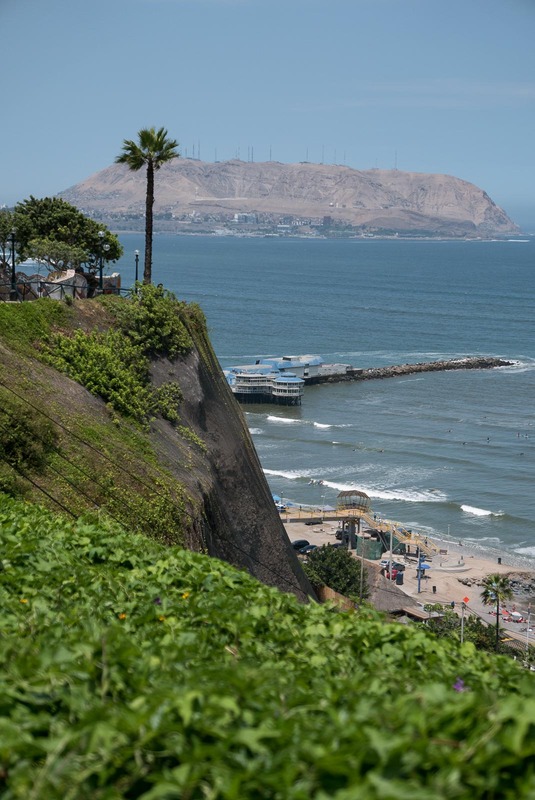 Back 1000 years to a Pre-Inca site in Miraflores – Huaca Pucllana. The site is a seven-tiered pyramid structure built on top of a hill and active between 200 and 700 AD. Compare that with Machu Picchu which most architects agree was built between 1438 and 1472. 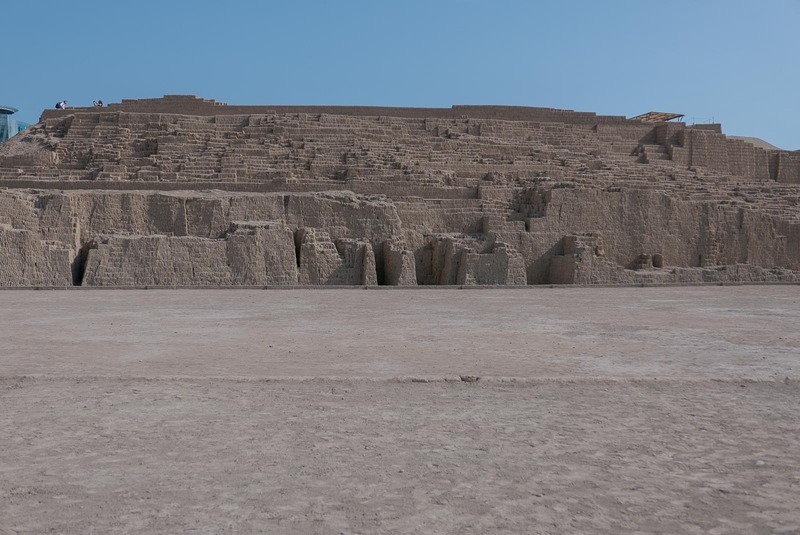 It’s hard to believe Huaca Pucllana lay buried for centuries but as is so often the case with our ancient historical buildings dirt and jungle kept the ruins hidden until the 1900s when, in 1981, the top of the pyramid was revealed. Archaeological work is ongoing but the site has been opened to tourists. Today you can walk through the ruins as part of a guided tour (in English or Spanish). The site is huge, but what always amazes me about such sites is that they can lay hidden for so long – what other treasures might be buried beneath our feet? 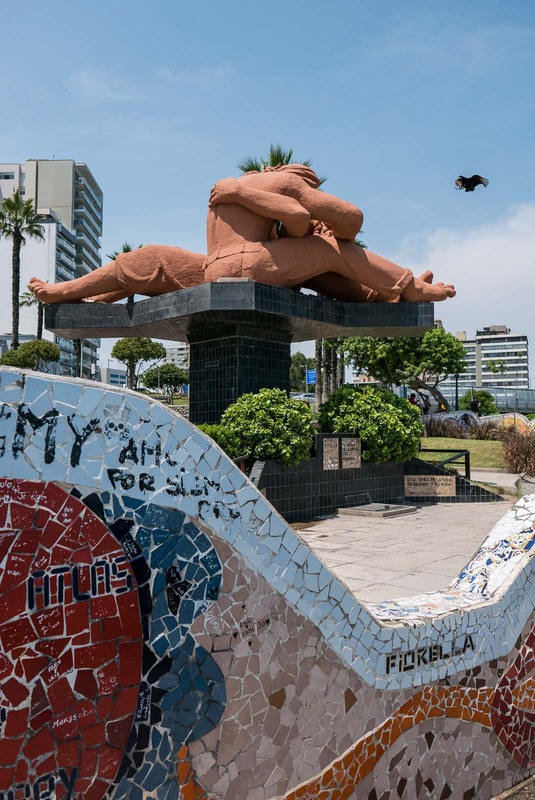 We don’t need to look too far to find the treasure of Barranco, an edgy suburb not far from Miraflores. 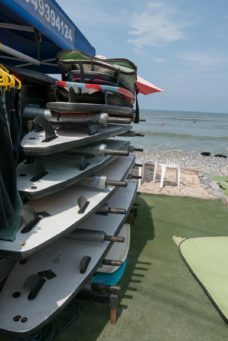 Our guide recommended it to us on our first night, so a few of us thought we would take a walk and find out what all the fuss was about. Walking along the beach we struggled to see it’s beauty, sure the sea was lovely, but it was a pebble beach until you get to the 50 metres of sand that makes up the beachfront at Barranco. You can’t really miss it. 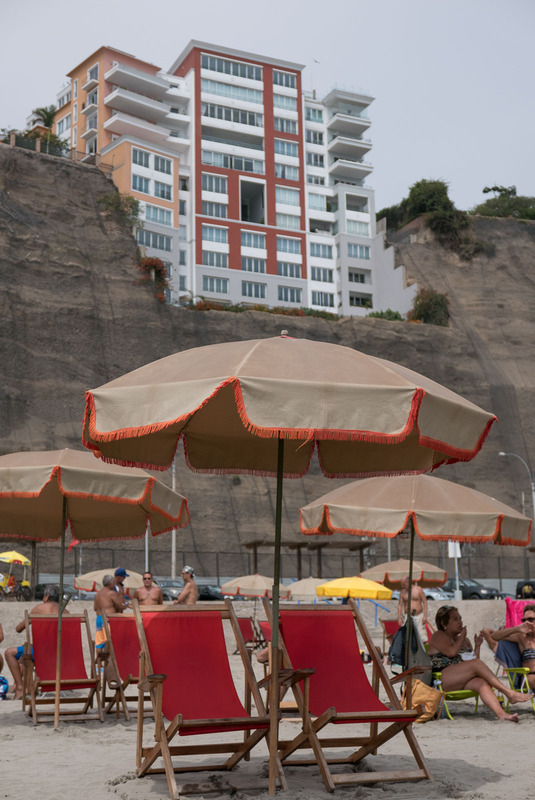 Every square inch is taken up by Peruvians soaking up the sun from their deckchairs. But it turns out, this isn’t what we were meant to be looking at. 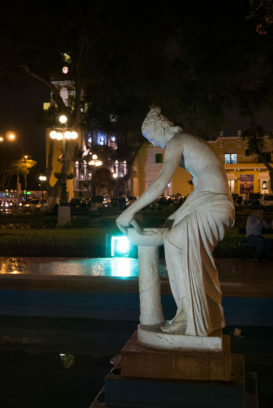 The real gem of Barranco is not its beachfront, but its nightlife. The city comes alive after dark. Street performers line the streets, as restaurants and cafes entice us with their offerings. 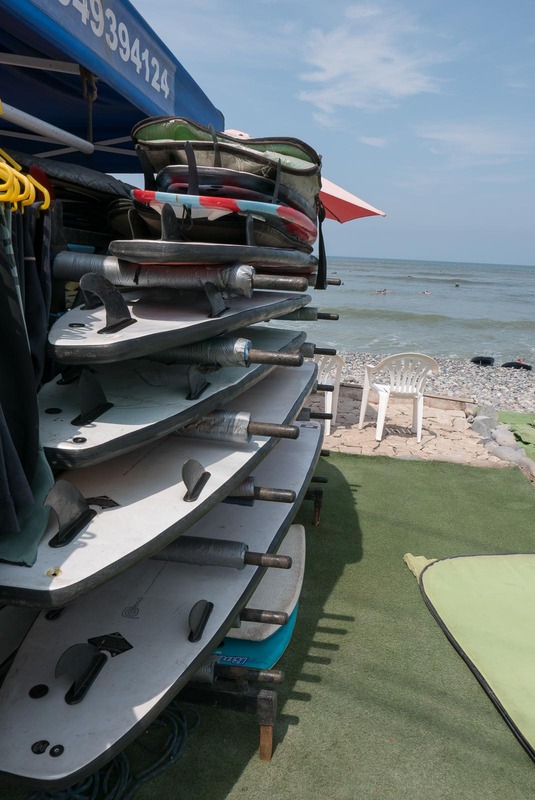 It’s hard not to feel like a local hanging out here. 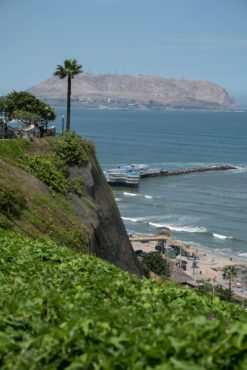 Enjoy this post and want to use it offline to guide your own adventures in Lima? You can now access this post through the GPSmyCity travel app. 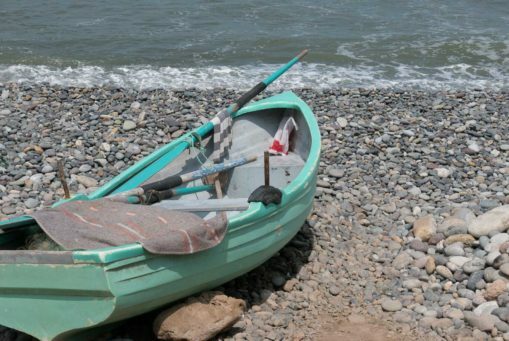 For a small cost you can even download the story with GPS coordinates so you know exactly where to go! It’s kind of like having a map, a Lonely Planet guide and a travel buddy in your pocket. You can access the app here. 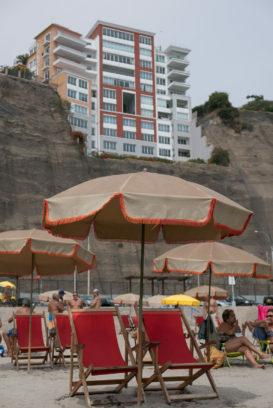 We stayed at Antigua Miraflores Hotel. While it was a little way out of central Lima, Miraflores is a lovely suburb to visit, with lots of good restaurants. Was it long enough? Lima is a big city, with lots to see and do, four nights was enough, but you could definitely stay longer. 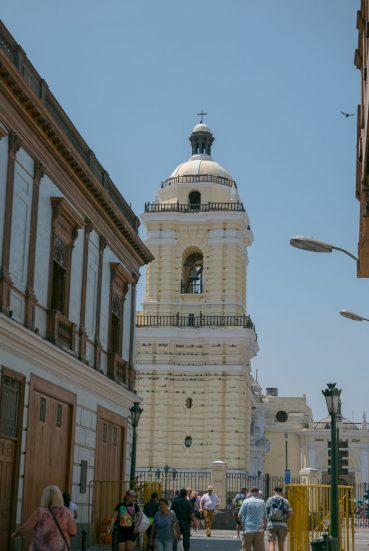 Highlights: the library in the San Francisan Monastery, checking out the Pre-Inca ruins at Huaca Pucllana, the beautiful Spanish and French influenced architecture along the boulevards in the old part of town. *I travelled to Peru as a tour host with the awesome travel company Two’s A Crowd.